Tornano da domani in circolazione su vinile di alta qualità gli album di Syd Barrett The Madcap Laughs e Barrett, entrambi del 1970, e Opel (1988). Li (ri)produce l'etichetta Rhino. With The Division Bell 20th anniversary box set, vinyl (and standalone DVD) grabbing headlines with its release around this weekend depending on where you are in the world, another set of releases that are due on Monday (June 30th) in the UK and Europe, are sure to be just as eagerly awaited by the vinyl junkies amongst you, and really shouldn't be overlooked - hence this reminder for you. 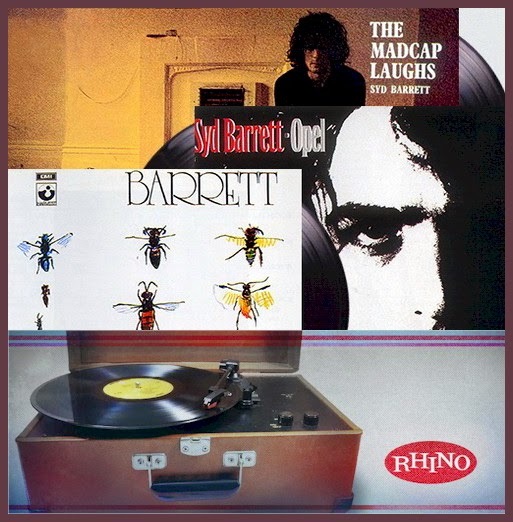 On that day, Rhino are releasing Syd Barrett's The Madcap Laughs, Barrett, and Opel albums on heavyweight 180g vinyl. With the resurgence of interest and take-up of vinyl, these high quality new editions are sure to be popular. For the Syd novices out there, The Madcap Laughs was his first solo album, released January 1970. Featuring a band including David Gilmour on various instruments, Jerry Shirley, Willie Wilson and Robert Wyatt, there are some very highly regarded tracks throughout the record. Barrett was to follow, in November of the same year. Again, David Gilmour performs on the album, as does Richard Wright. The songs on the album generally have a lighter tone than Madcap, but this was to be his second and final conventional album. Opel was released in October 1988, and was a collection of unreleased material and alternate takes from the Madcap and Barrett sessions.